There are many places in Costa Rica’s Central Valley where you can experience what the country is all about, maybe too many. When my wife and I have friends visit, we often have a hard time deciding what to show them. That being said, we always save one day for what I call the dynamic-duo of the Central Valley—Poas Volcano and La Paz Water Gardens. These two iconic destinations are close enough to each other to visit in the same day and they provide a wonderful experience. Poas Volcano National Park is best visited early in the morning. Typically, in the late morning and afternoon the cloud forest moves in making visibility poor. The best shot at a clear day is early and, on a clear day, not only can you see the smoking caldera (the depression in the volcano), but also in the distance, the cone of Arenal volcano and the Caribbean Sea. After viewing the caldera, those who are willing to hike can take one of several side trails to view other areas of the park. 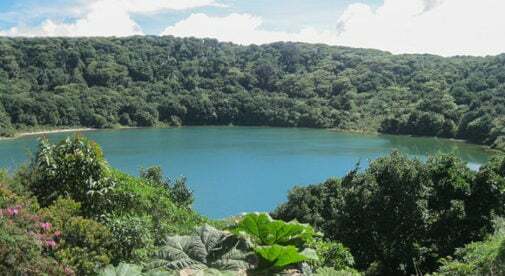 The longest one is a mile long and takes you to Lake Botos, the water of which fills an extinct crater. Along the hiking trails are some of Costa Rica’s most beautiful birds: the emerald toucanet, tanagers, hummingbirds, and the famous resplendent quetzal. Plan to spend at least an hour at the park; two or three if you are going to explore the additional trails. There is a modern visitors center and museum at the entrance as well as a small cafe that serves hot drinks, sandwiches, and snacks. It’s open seven days a week and the entry fee is $10. As you leave the volcano heading to La Paz, the road travels down the mountain and becomes dotted with strawberry farms. The volcanic soil is nutrient rich, creating strawberries that are big, juicy, and taste wonderful—the perfect snack to have before heading off to see waterfalls. The second part of this dynamic-duo day is to travel about 20 minutes from the volcano to the entrance of La Paz Waterfall Gardens. This park offers a bit of everything. It sits in a rain forest with hiking paths that lead to five spectacular waterfalls. The trails are groomed or paved and are well marked. It is not just waterfalls at La Paz, the park has lots of animals to see…all of them cannot be returned to the wild because of injury or interaction with humans. There is a hummingbird feeding area where visitors can walk around with the tiny birds buzzing by. The same is true for the butterfly garden—you can walk around with hundreds of butterflies floating by or landing on your shoulder. If birds are your passion, there’s an aviary where you can view different species of the colorful birds of Costa Rica. There is even a netted area where you can walk in and have a toucan sit on your arm. In addition to the birds there is an exhibit of Costa Rican jungle cats, a reptile house, and an amphibian room. La Paz has a restaurant that serves a buffet, a souvenir shop, and a world-class hotel. Entry into the park is $40 for adults and it’s open daily. Visiting both Poas and La Paz on the same day is the perfect combination. By doing so, we give our guests a wonderful experience and free up other days to see even more of the country. If you go to either or both places be sure to take sunscreen, a light rain jacket, insect repellant, comfy shoes, a camera and, of course, your sense of adventure.